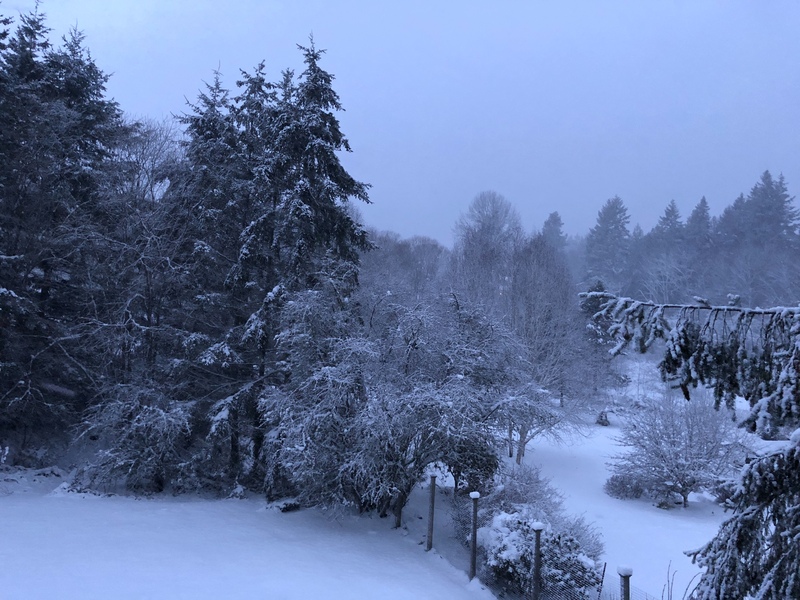 Bainbridge Island, morning (February 10, 2019). This year’s winter has been intense across much of North America. 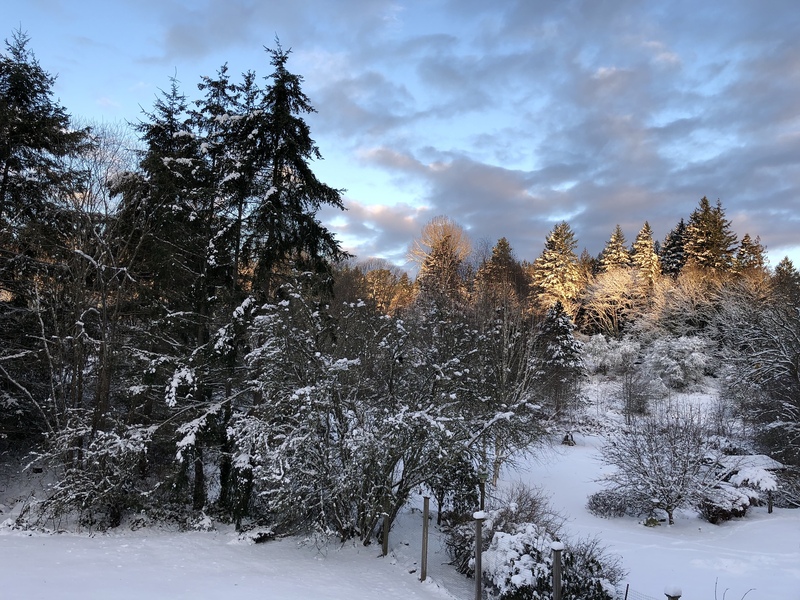 Even here in Puget Sound, where snow is mostly occasional and swiftly gone, the drifts lie heavy and deep upon the earth. For those of us accustomed to the Northwest’s seasonal grays and greens, so much whiteness is otherworldly. Stevens strove to attain the mind of winter, where all the poet’s fictions, the “pathetic fallacy” by which romantics color the world with their own feelings, are stripped away, leaving only the bareness of uninterpreted bedrock reality. The tree without the seductive flutter of fresh spring leaves, or the gaudy makeup of autumn color. Only behold “nothing that is not there and the nothing that is.” No more delusions or illusions. A wind that is only wind and not the sound of our keening hearts. Emerson also stood in that bare place, and in what Harold Bloom calls “the central passage in American literature…the crucial epiphany of our literature’s Central Man,” he experienced what he called a vanishing of ego: “I become a transparent eyeball; I am nothing; I see all.” This pure transparency is itself a fiction – the self and its experience are still being celebrated––but it is a brave leap into the mind of winter nonetheless: to see the world as it is, not as we would have it. Let go of our scripts. Stop coloring the world with our desire. Wait without thought, without premature description, for the world to reveal itself in time, to say whatever it wants to say to us. Not everyone who journeyed to the regions of ice was as dour as Melville. Many were inspired by their experience of the sublime. Sir Ernest Shackleton, writing of his own harrowing sojourn in Antarctica, said, “We had pierced the veneer of outside things…We had seen God in his splendors, heard the text that Nature renders. We had reached the naked soul of man.” But as the history of Polar exploration tells us, such knowledge comes with a cost. When Amundsen dashed to the South Pole and back with efficient ease and no loss of life, the English admirers of the tragic Scott expedition, who had “died like gentlemen” in the heart of the white void, criticized him for making it too easy and missing the point of full immersion in the mind of winter. “Are these people mad?” was Amundsen’s laconic response. Bainbridge Island, evening (February 10, 2019). But we will, and that is the endearing nature of the cycle, the turning of the wheel that will take us through comedy, romance and tragedy all over again. We haven’t really forgotten our hard-won knowledge, our steely mind of winter. It’s just that life cannot––should not––be lived without the bright hues of our affections. And so we will keep risking illusion for the sake of the ecstasies that the unromantic Amundsens never taste. 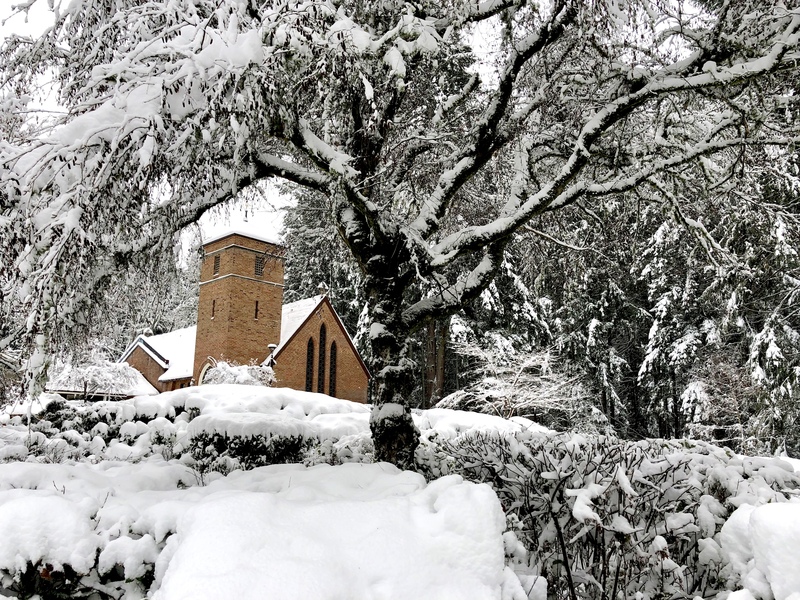 St. Barnabas Episcopal Church, Bainbridge Island, Washington.